On the other, uh, $86.90? 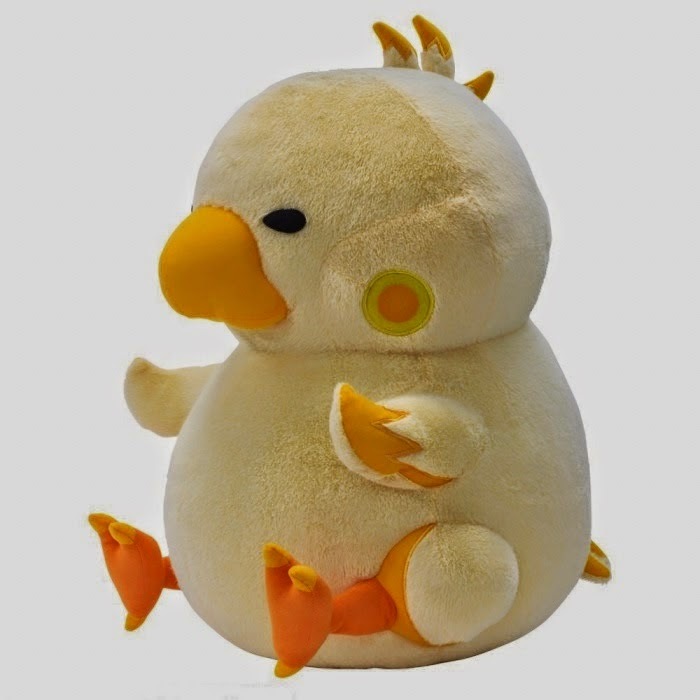 Sure, this "Fat Chocobo" plush is rather large as these things go--it's 11 by 12 by 17 inches, basically--and its design was inspired by a 3DS game I'm very much looking forward to sinking my teeth into soon (that would be Theatrhythm Final Fantasy: Curtain Call), but even then I can't say I think it's worth nearly $90. Should any of you feel differently on this subject, you may want to go ahead and order one of these (admittedly adorable) toys via shopncsx.com. There's quite a markup on Tomy's upcoming Terra Cresta toy, too. I like NCS... in fact, I bought my first Saturn import from those guys, but I can't justify spending $80 on a fancy Transformer. Yeah, NCS definitely seems to price their wares on the high side, especially as of late. Going with other shops, like AmiAmi, often seems like a better idea, although AmiAmi doesn't usually have the kind of stock shops like NCS have, nor does AmiAmi stock older games and systems. I pretty much use AmiAmi for pre-orders of current games at the moment. I wonder how AmiAmi's price would work out with shipping? Aren't they shipping from Japan? NCS probably still ends up with the more expensive deal (since they had to ship from Japan and then to you) but it might not be as bad as it looks? People pay the prices. Just like 6-year-old Nintendo games commanding full price. It's almost like the market for them doesn't like their money or is too rich to find the best price. Oh, I know that's true when it comes to games, Chief, and probably even sometimes when it comes to related items like these, but even then I'd guess that the amount of people willing to spend nearly $90 on a chocobo plush is very small. Or at least I hope that's the case! Although you're probably right about the shipping difference, Michael, my experience with AmiAmi so far is that shipping is pretty darn reasonable. The main issue w/ using AmiAmi in a case like this is that once the product goes out of stock, it's unlikely to be offered for sale again. In the end, that usually means you have to pre-order games from them, although products like this seem to stay in stock for quite a while longer. I hope the market isn't big. Man the markups are so ridiculous that if they decided to do a fire sale it would still be handsome profits all around. Fat Chocobos are so adorable. They are the best looking mounts in FF14. Good to know! I've been eyeing a few things over there myself but haven't made any purchases yet. Maybe I will! I have a feeling that's why shops like NCS mark up products like this in the first place, Chief. That way, when they have a fire sale down the road, the products look a lot more enticing. And in the meantime, maybe they can snag the odd sale here and there at the horrible high price. I've bought two JP 3DS games from them so far. Both were pre-ordered before release. One word of warning about them: if you pre-order a game and then cancel your pre-order, you'll piss them off and they may "blacklist" you. Actually, I think they'll let you do it once (they let me do it once, at any rate), but after that, watch out. So, make sure you really want a particular game before you place a pre-order for it through AmiAmi. That is very true. More so for retailers & e-tailers that have a considerable amount of overseas customers. Yes, or at least I believe that to be true.